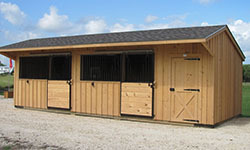 Top Quality Horse Barns, Run-in Sheds & Prefab Cabins for Over Thirteen Years! For those who own horses, they know that a great addition to any ranch or large property is a horse barn. Texas built horse barns from Deer Creek Structures, a family owned and operated business that started in 2005, are the perfect addition to any property that houses horses. 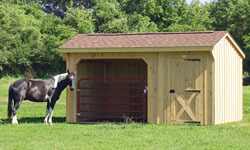 Made in the heart of Texas, these quality horse shelters and run in sheds are perfect for all types of horses. They will allow your horses to be in a safe secure place when they need to be. Welcome to Deer Creek Structures where we offer top quality portable horse barns for sale. 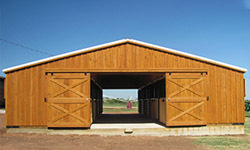 We fully assemble custom-built shed-row horse barns, run-in sheds and livestock shelters. 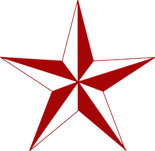 We are a close-knit Christian family business where we endeavor to practice the Golden Rule and to fulfill God’s Royal Law of Love. We are located in the heart of Central Texas, 20 miles south of Waco. Learn more about Deer Creek Structures. Barns, Sheds, Cabins Ready To Deliver! 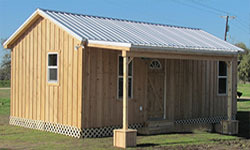 We have certain sizes of portable barns, prefab cabins, run in sheds and chicken coops in stock. These structures are our most common sizes and are ready for quick delivery. if you need a structure in a hurry, we have a model that will work for your property. We can also custom build any size or need.